The National Convention and Exhibition Center completes the customs declaration of the import fair information in advance through the “single window” and “Internet + Customs”, and adopts the “one-time filing and sub-submission of the list” to handle the customs procedures to ensure the rapid clearance of the imported expo materials after arriving at the port. Exhibitors their products, special items and other exhibits need to be examined and approved for quarantine. Exhibitors should submit an application before entering the country, and they can enter the country after approval by the customs. The temporary import goods of the Import Expo will adopt the customs-integrated mode. The National Convention and Exhibition Center or its entrusted home transportation service provider will go through the declaration formalities at the Shanghai Customs, and the port customs will carry out the inspection and release. Other trade methods for importing exposition materials, overseas exhibitors or their agents shall go through customs formalities in accordance with the current regulations. For the temporary entry of goods at the import fair under the ATA Carnet, the competent Customs shall examine and endorse the goods, and the expiration date of the re-export shall be the same as the validity period of the Carnet. Imported exhibits of the Expo are subject to inspection, inspection and quarantine according to regulations. For exhibits that need to be inspected at the exhibition hall due to special circumstances, the National Convention and Exhibition Center or its commissioned home transportation service provider shall submit an application to the exhibition hall for inspection. The National Convention and Exhibition Center shall provide necessary office space and inspection facilities. For the inspection and inspection of normal exhibits, the customs formalities for the inspection and inspection operations shall be handled. During the period of the import fair, the customs will send personnel to supervise the field according to law. 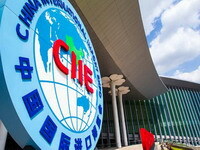 The National Convention and Exhibition Center, the home transportation service providers and exhibitors shall abide by the customs’ regulations on the display and sales of exhibits and cooperate with the customs to do a good job in supervision. Meat and its products (organs, casings), fresh eggs (including edible turtle eggs, edible turtle eggs), dairy products (including raw milk, raw milk products, bus sterilization, pasteurized milk produced by the process), animals Aquatic products (amphibians, reptiles, aquatic mammals and other cultured aquatic products, Japanese aquatic products), edible gelatin, edible bone horns and their products, animal-derived Chinese herbal medicines, bird’s nest. Non-edible animal products: raw hides, raw hairs, bone horns and their products, silkworm cocoons, fish meal, meat meal, bone meal, meat and bone meal, oil, blood meal, blood, etc., organic fertilizer containing animal ingredients. Seeds, seedlings and their propagation materials. Fruits and vegetables: fresh fruits, tomatoes, eggplants, and capsicum fruits. Grains: wheat, corn, rice, barley, rye, oats, sorghum, etc. Beans: soybeans, mung beans, peas, red beans, broad beans, chickpeas, etc. Potato: potato, cassava, sweet potato, etc. and processed products thereof. Feeds: wheat bran, bean cake, soybean meal, etc. Tobacco: tobacco leaf and tobacco sheet. Animal and plant products involving the scope of the GM labeling catalogue should state whether they are “transgenic”. For example, genetically modified ingredients should be provided with the “GMO Safety Certificate” issued by the Ministry of Agriculture.